Build Your Own Annapolis Wherry in One Week! You may register for this class through Great Lakes Boat Building School. 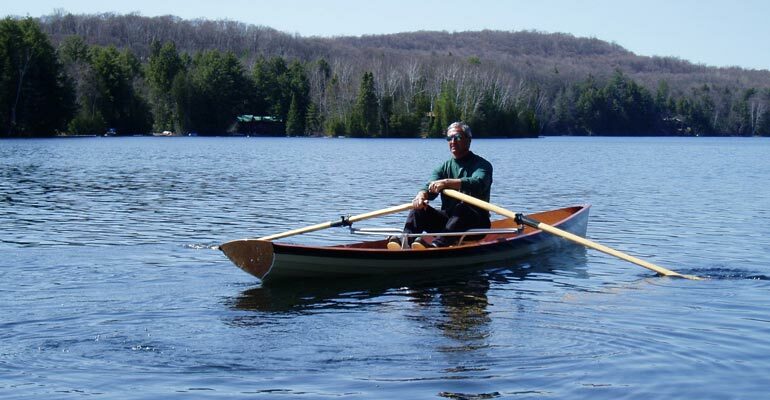 In this five-and-a-half-day course, each student will build an Annapolis Wherry or an Annapolis Wherry Tandem from a Chesapeake Light Craft kit. The Annapolis Wherry is modeled after the graceful 19th century livery boats used on the River Thames. 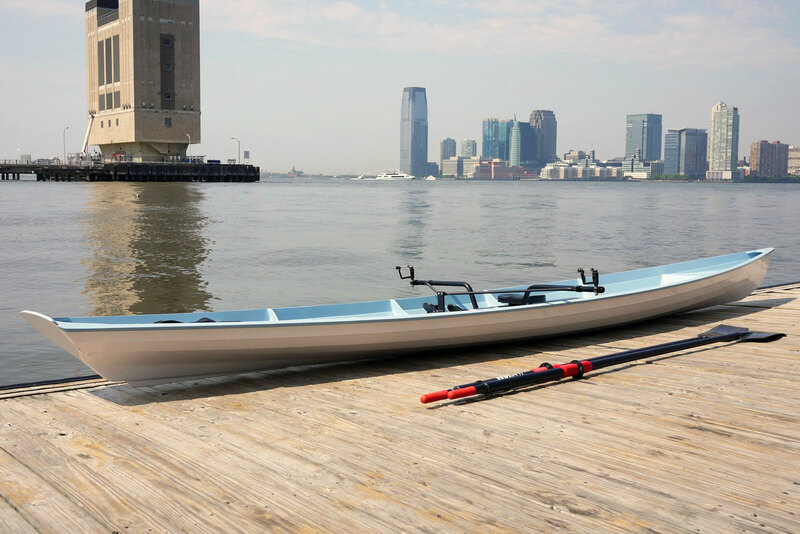 She is, however, lighter and slimmer, combining breathtaking grace with thoroughbred performance under oars. Solid stability, sea-kindly lines, a buoyant bow, and ample flare make the Wherry a natural choice for rowing in choppy water. While fixed seats are standard, the Annapolis Wherry is primarily a sliding-seat boat. With the Piantedosi Row Wing installed, cruising speeds easily reach 5 to 7 knots. 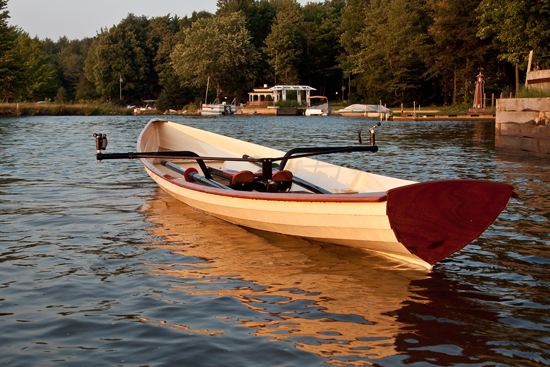 The Annapolis Wherry may be unsurpassed as a rowing trainer, exercise boat, long-distance cruiser, or open-water racer. The Annapolis Wherry is made of 6mm okoume plywood with 9mm okoume plywood frames, thwarts and flotation tanks. Outwales, breasthook and quarter knees are solid mahogany. The boat is built using the LapStitchTM construction technique. Traditional lapstrake boatbuilding employs molds over which planks are nailed or riveted together. 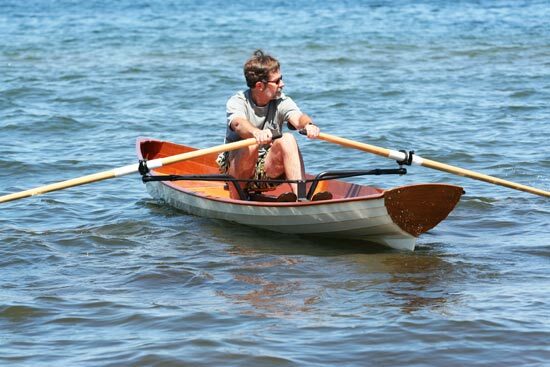 By using precision-rabbeted, computer-cut plank shapes and frames which double as molds, a CLC LapStitch kit boat is wired together just like a stitch-and-glue kayak. When glued with small epoxy fillets, the planks create a stiff and strong hull that will last for fifty years. The precut hull planks are scarfed together, and then connected to the frames and each other with copper wire stitches, then fixed in place with epoxy fillets. Next come thwarts, knees, wales, and air tanks. Fiberglass cloth on the bottom inside and out provides abrasion resistance. The instructor will discuss the proper way to sand and paint or varnish the boat. Sliding seat units may be purchased at Chesapeake Light Craft. At the end of an absorbing week, students will have learned about stitch-and-glue basics, including epoxy work, fiberglassing, and laminating. Building a LapStitch boat is easy, but assembling an 18' boat in a week means a tight schedule, and you'll be spending plenty of time in the shop.